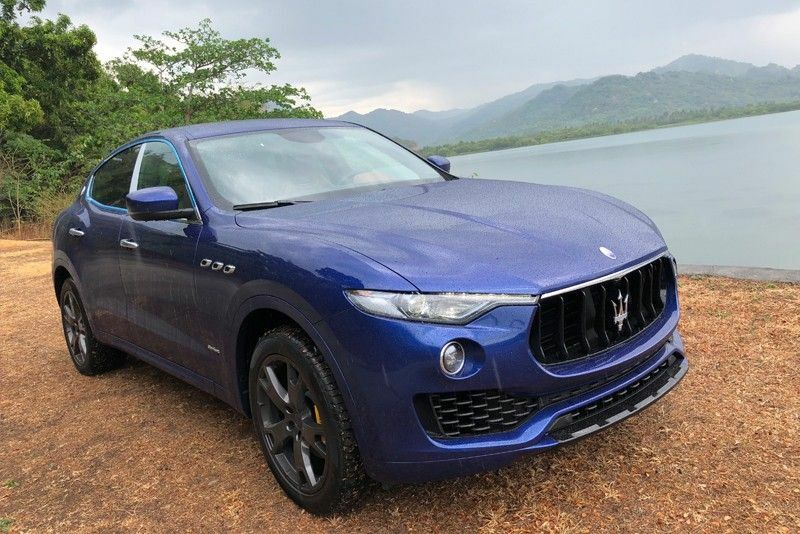 Blue on Blue: A blue Maserati Levante GranSport takes on the blue coast of Batangas. “We travel not to escape life, but for life not to escape us.” Well said, by an anonymous source. But for most people, days are consumed by work and other responsibilities. Travels are often viewed as luxuries that are cumbersome or difficult to arrange. Consequently, life escapes a lot of people without their knowledge. Last week, Autostrada Motore Inc. taught us how to escape our daily life so that we can embrace life. The beauty of the “Maserati Escape” was in its elegant simplicity in concept and execution. It was a one-day affair that started early morning in Manila Yacht Club. After Ferrari Philippines Executive Director Marc Soong briefly welcomed us over coffee and tea, we boarded a 56-foot Aicon Boat. As we sailed away from Manila Yacht Club, the buildings, the traffic congestion, and the worries faded away. We sat on the top deck enjoying the view of the sky and sea as we nibbled on a platter of cheese and cold cuts. Some of our friends were sipping cold beer. It was only 9:00am yet there we were—having cheese, drinks and lively conversations while sailing at sea. This was a stark contrast to a normal day in Metro Manila. But that was the whole point of the event. Maserati Philippines Executive Director Jason Soong said they want people to experience the Maserati lifestyle. Looking around the crowd of professionals, journalists and successful individuals in the boat, one thing was clear—the Maserati lifestyle is not about being carefree. It is about having the passion and drive to be successful, while appreciating the beautiful things in life. In the two hours of cruising from Manila bay to Batangas, we did things that we truly enjoyed. We enjoyed the views of the sun and sea. I chatted with friends, I read a book, and took a power nap. We docked in Pico De Loro, Batangas for an Italian-themed lunch. While others relaxed and had coffee before heading back to Manila, I opted to meet the new members of the Maserati family. When a person skips coffee and dessert to drive, THAT says a lot about the car. But THAT is the type of vehicle a Maserati is. It makes you WANT to drive. It was sheer pleasure to drive the 2018 Ghibli around Hamilo Cove. The Ghibli GranSport effortlessly sped through the winding, tree-lined roads. The Ghibli’s recent upgrade to electric power steering translated to an even smoother handling than its predecessors. Sitting inside, I couldn’t help but admire the Ghibli’s impeccable red-on-black leather seats and interiors lined with “Ermenegildo Zegna” silk. As we made our way back to Manila by 1:30pm, I drove the Maserati Levante Q4 with Philippine Tatler’s Shauna Jay Popple as my passenger. Shauna confessed to me that she is not really a “car” person and she barely drives. But if there’s something Shauna knows well, it’s luxury and style. As we expressed differing opinions about a myriad of topics from our careers to marriage to restaurants, we shared the same overwhelming admiration for Maserati vehicles. Incubated inside the luxurious Levante, we were comfortable and impervious to the transformation in our outside surroundings as we drove from scenic mountains to the more chaotic, traffic congested parts of Batangas and Manila. Before 5pm, we were back in Manila Yacht Club. I learned something valuable from the Maserati Escape that day. It didn’t take much time or effort to have that perfect, beautiful day. We didn’t have to book flights, or wake up inhumanely early, or take too much time away from work. The whole experience took less than a day, but it created memories that can last a lifetime.